This is the Limited Super 7 Magazine CCP Limited Jumbo Hedorah. This wonderful translucent vinyl stands approx. 11 1/2 inches tall and is approx. 12 inches long. The figure features Hedorah with one eye closed and comes with batteries that allow the other eye to light up and blink! This figure was limited in production to just 100 pieces. Comes mint in bag with header. 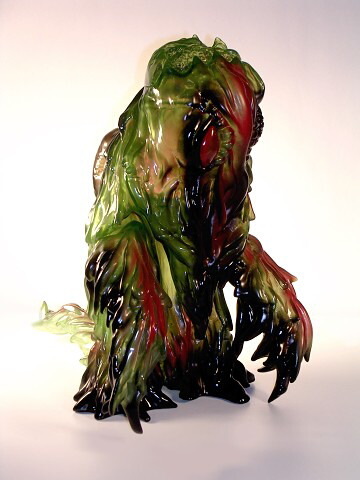 This 2004 CCP Hedorah Figure really looks like a shiny sludgy dripping SMOG MONSTER!!! The vinyl is a striking shiny COAL BLACK and Hedorah’s eyes are a PIERCING RED with Black Rings and Green Irises. They do not light up but they are among the BEST SMOG Monster Eyes we have seen. The figure is hard vinyl and stands approximately 8 inches. The arms are articulated. The figure has a slight scuff on the tip on its head and on one of the strands that come down from his “face.” It is out of the bag and does not have the header. GODZILLA 1964 WITH BITING LARVA! 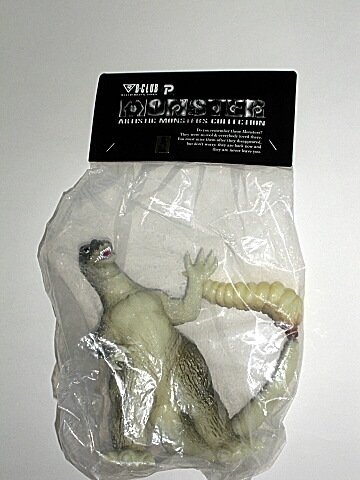 Made by CCP and B Club Co. of Japan in 2005 this unique figure shows GODZILLA IN PAIN!! You would ROARRRRRRRRR too if you had a GIANT MOTHRA LARVA BITING YOUR TAIL! This AWESOME FIGURE represents a scene from the EXCITING TOHO MOVIE GODZILLA VS. MOTHRA 1964. Not only is this a wonderful detailed sculpt…IT GLOWS! Made of a GLOWING VINYL and painted with a light black spray, this Godzilla has bright Silver Teeth! The larva is a lighter yellow/brown vinyl with RED EYES! The way this figure is made, the Larva pivots on the tail so he can be posed as you wish! This highly detailed figure is articulated at the arms, legs, neck, tail and where the larva is biting the tail! We have only seen one of these beauties in all our hunting in Tokyo and beyond! The figure stands approx. eight inches tall and the larva is approx. five inches long. COMES MINT IN BAG WITH COOL HEADER. The detail on this AWESOME sculpt is FABULOUS. We can almost feel Gamera’s blistering breath coming from his open jaws! The Claws are MENACINGLY Sharp looking. This great CCP figure was produced in 2007 and limited to 500 pieces. It is Gamera II as seen in the 1996 Daiei movie GAMERA Guardian of the Universe. Gamera stands about 9 inches and is articulated in his elbows and legs. CLAWMARK TOYS WARNING: Not for very young children due to sharp claws. SWIMMING AND “GLOWING” HEDORAH BY CCP CO. OF JAPAN! Produced in 2004 this is one of the most unique of all Hedorahs. 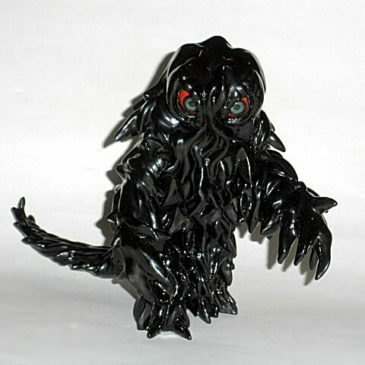 This wonderful vinyl deception of Hedorah the SMOG MONSTER in his SWIMMING FORM measures over 11 inches long and is approx. seven inches wide. He is made of hard GLOW vinyl and is colored a smoggy green with with light yellow highlights. His eyes are a DEEP RED! His tail is turned up in a swimming pose. THIS GLOWING HEDORAH REALLY GLOWS BIG TIME! The photo of him in the dark is not enhanced! He has two “feelers” that are articulated under his jaw (smoggy has a jaw?). THIS AWESOME SWIMMING “GLOWING” HEDORAH IS VERY, VERY HARD TO FIND EVEN IN TOKYO! COMES MINT IN BAG WITH HEADER. 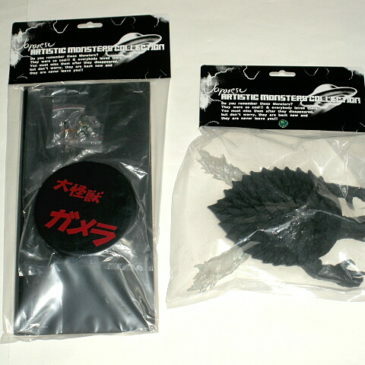 CLAWMARK TOYS WARNING; COLLECTING JAPANESE KAIJU FIGURES MAY BE HABIT FORMING! PLASMA GAMERA 3! 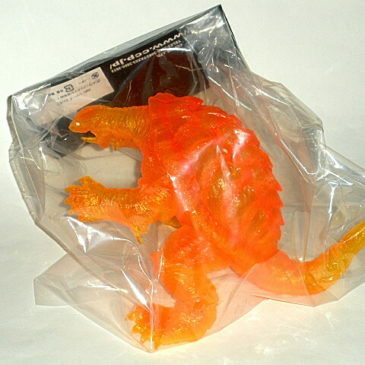 This Gorgeous Plasma Gamera was for sale at TOKYO WONDERFEST February 12th 2012. It stands approximately 8 inches tall and is 12 inches from the tip of its tail to its snarling snout. Produced in a beautiful two toned glowing orange TRANSLUCENT VINYL with darker orange tones. The plasma effect coloration is AWESOME. Gamera 3 is articulated at both legs. COMES MINT IN BAG WITH HEADER. CLAWMARK TOYS WARNING; Not Recommended for young children due to sharp claws and tusks. Scroll down for additional photos. 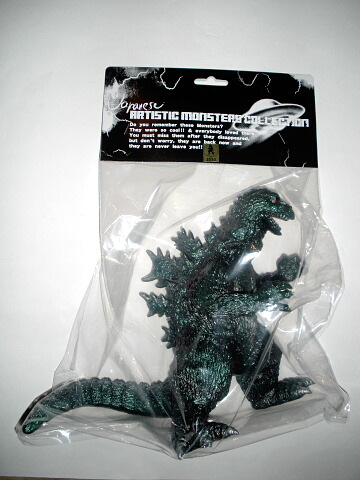 Here is the 2010 CCP (Character Contents Production) Company AMC series Green Version of Godzilla 1962 King Goji. 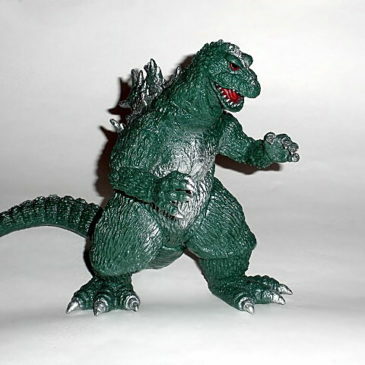 The Figure stands 9 inches tall and is produced in a medium green color which is very similar to the Bandai Godzilla 1962 Green color vinyl. It has silver sprays. It is not articulated but is molded in a great ACTION pose. It comes Mint in bag with header. 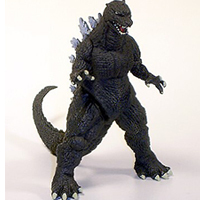 Here is the 2010 CCP (Character Contents Production) Company AMC series Blue/Green Version of Godzilla 1962 King Goji. The Figure stands 9 inches tall and is produced in a beautiful Blue/green color which is really STRIKING!. It has silver sprays and BRIGHT RED EYES! It is not articulated but is molded in a great ACTION pose. It comes Mint in bag with header. WE LOVE HIS BLINKING EYES!! WE LOVE HIS DRIPPY SLUDGE! WE LOVE HEDORAH!! This is one of the Latest HEDORAH figures by CCP CO. OF JAPAN. Produced in 2011, this Hedorah is listed by CCP as the JUNGLE LIMITED VERSION(the Jungle is a toy store in Osaka). What a beautiful figure! Standing Hedorah figure stands approx. 9 inches tall and over 9 inches long. This magnificent Smog Monster is standing over a smoke stack getting a good wif of SMOG! The vinyl on this figure is A GLOWING TWO TONE GREEN! The eyes LIGHT UP AND BLINK when you smack the back of his head. YOU HAVE TO SMACK HIM REALLY HARD! The arms and tail are articulated. You can pose him with our without the smoke stack. The detail on this SMOG MONSTER is AMAZING! THIS IS AN OUTSTANDING GLOWING HEDORAH! THE PHOTO OF HIM GLOWING WAS TAKEN WHILE STILL IN THE BAG! The figure comes MINT IN BAG WITH HEADER. IT’S A BIRD! IT’S A PLANE! NO… IT’S FLYING GAMERA 1965! The CCP Co. of Japan produced this wonderful FLYING LIGHT UP GAMERA to help celebrate the WINTER TOKYO WONDERFEST on 2/12/2012. 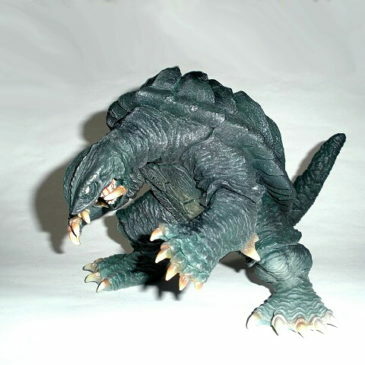 The sculpt is one of CCP’s best efforts to capture the 1965 version of GAMERA as he was seen in the movie GAMERA THE INVINCIBLE! The hard vinyl figure is approx. 9 inches long from the tip of his SNARLING SNOUT to the tips of his LIGHT UP JETS! Flying Gamera has articulated arms and comes with a display stand that includes the base (with his name in Japanese) and an “upright” post over 12 inches high. WE LOVE THIS FIGURE! When you tap his back the lights come on in his clear plastic jets. TWO EXTRA SETS OF LIGHTS AND BATTERIES COMES WITH THIS FIGURE. The LED lights make this Gamera look REALLY COOL in a dark room, or he would look great on the shelf towering above the other Gamera’s you might have in your collection! 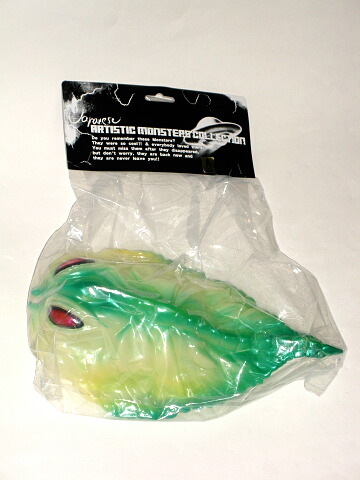 COMES MINT IN BAGS WITH CCP “ARTISTIC MONSTER COLLECTION LOGO. This is the latest and greatest from CCP! CLAWMARK TOYS WARNING; NOT SUITABLE FOR YOUNG CHILDREN DUE TO SMALL PARTS AND SHARP CLAWS!